NPR has done an interview with my cousin, Channa Cook, whose charter school, the Sojourner Truth Academy, opens in New Orleans this month. It’s an amazing project… and a good listen. 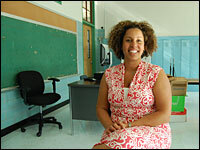 Channa Cook, principal of Sojourner Truth Academy, sits in a classroom at her school. The 28-year-old is among the educators fueling the boom of charter schools in New Orleans. All Things Considered, August 14, 2008 Â· Since Hurricane Katrina, New Orleans has become a laboratory of sorts for charter schools. Seven new ones are opening this month â€” supported by millions of dollars in federal and private grants. The funding draws educators like 28-year-old Channa Cook to New Orleans. class on August 9, 2007. I teach first grade and I was wondering if you know of any resources for teaching reading. I would appreciate any information you might have to share.Thank you. If you have something more specific in mind, let me know and I’ll see what I can do. How do I help her find those things that she’ll love learning about her entire life? And how can I help instill in her the work ethic to master it, to, as Darren asks of his students, become an expert at it? And how can she get through all of this with a strength and character that is measured by her own standards and not societies? I’ve written a lot here about passion and I’ve noted Will’s earlier writing about passion-based learning, but I think these questions can lead teachers in their work, and thus form the foundation of a passion-based education. In contrast to the empirical behaviorist view that knowledge about an objective reality can be simply and reliably passed on from teacher to student, the kernel of constructivist philosophy is the belief that all knowledge must be actively and subjectively constructed in the mind of each individual. This core belief is associated with several corollary beliefs that have become hallmarks of constructivist pedagogy. The most important of these corollaries is captured by the adage of learning by doing. Constructivist philosophy holds that the learner should take an active rather than passive roll in the learning process, and that the tasks required of the learner should have an authentic context and purpose. It is under these conditions that the transfer of learning from the educational experience to the “real-world” is believed to be most successful. In addition, learning is often considered by constructivists to be a social process, involving the negotiation of meaning between individuals and the distribution of knowledge over social networks. It is commonly accepted that individual learners can complete more sophisticated tasks with the aid of mentors or peers than they can on their own. It is also commonly accepted by constructivists that individual learners will have different interests as well as different strengths and weakness, including a varying degree of aptitude not only in mathematical and linguistic intelligence but also in multiple other kinds of intelligences. Criticisms of constructivism often focus on the lack of structure provided to students, however many constructivist educators insist on a structured environment in which students’ knowledge construction can be facilitated. Such an environment is one in which students are challenged without being frustrated and in which they are focused on intentional (rather than incidental) learning. At a minimum, a constructivist learning environment will motivate and engage learners. Most importantly, it will also provide a context for learning, opportunities for inquiry or discovery, and a framework for collaborative learning. The value of all of these elements is increased if the environment also facilitates reflection and metacognition on the part of the learner. Such an environment can also be useful for the development not only of traditional school skills but also difficult-to-teach “soft” skills and “21st century skills”, such as digital-age literacies, inventive thinking, effective communication, and high-productivity. Within such a learning environment, the role of the teacher in providing support to students is especially critical. Each of these elements of a constructivist learning environment will be discussed in greater detail in the following sections. Each section will explore traditional constructivist perspectives, the contributions of educational technologists, and the more recent literature on video games and education. I enjoy reading the School 2.0 manifestos. They offer a glimpse into a world where teachers are free to be passionate and engaging, where students really want to learn, and where the restrictive policies of our current world do not exist. This is certainly what I am working toward. We need to learn how to sustain conversations that are initiated by the students themselves, not conversations that emerge from the official Ministry documents or our own interests and beliefs. I think that passion-based learning will help, but I also know that there is much more that I can do. It seems to me that this new approach will require that we revisit Vygotsky’s Zone of Proximal Development. Perhaps we could refine the notion of “instructional conversation” (Tharp & Gallimore, 1991) where the teacher is involved in “assisted performance.” This approach is not perfect but I think it gives us a good place to start: “To truly teach, one must converse; to truly converse is to teach” (Tharp & Gallimore, 1991). I love that last quote… and to boot, Konrad cites Dewey several times in his (rather rich) discussion. I’m not writing much about this topic right now, but I know it’s found it’s place in my own schema… I’ve long known that what draws me to people and what energizes me most is passionate conversation, though I may not have called it that. Now Konrad has helped build an explicit link between this and my work as an educator. Now how on earth do I categorize this post? What is the “Real” job of teachers? – Practical Theory For some great stories about teaching, read this post by Chris Lehmann… and then read the comments.